It stayed on the seat for a few hours afterwards! I dashed outside when it had stopped to check none of my precious plants had been broken, everything seems ok. 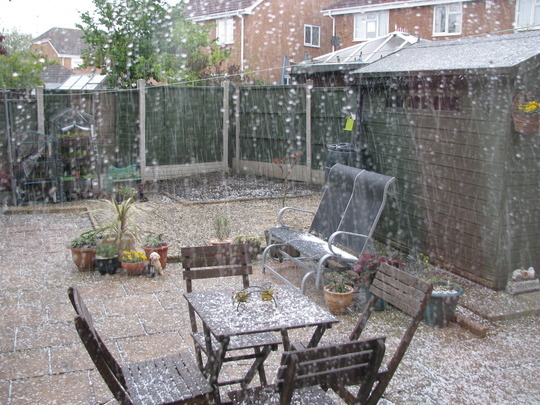 There was another hail shower about an hour later but not as bad as this first one. Who’d have thought it was May? I really hope it starts warming up soon, my tomato plants are only about two inches tall! Previous post: A Busy Weekend! Next post: Some colour in my garden! We had exactly th same this afternoon. Crazy weather! 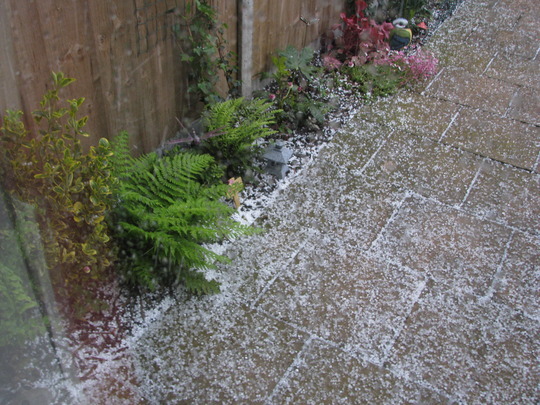 This week, many parts of the UK have had hail. Roll on warm, sunny, summer days ! I think at this rate I'll be buying more jumpers and putting my summer clothes in the attic! I think we all hope it warms up soon. Had enough of the cold now!! I was at a garden centre when the hail started, being a man who thinks nothing can harm him i stayed outside for a little while looking at pots. Then it started hurting my bald patch on my head, so rather than running and looking weak i calmly walked up the ramp and into shelter. My head is still sore now..lol.. 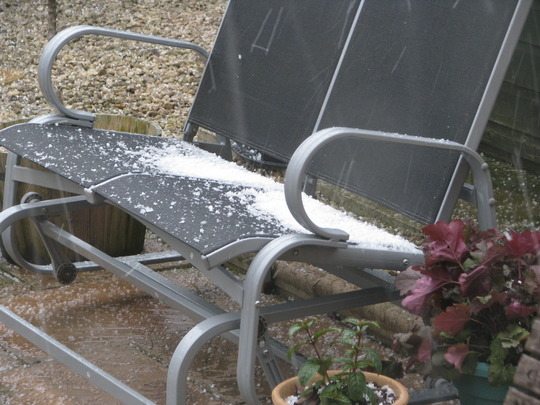 It doesn't seem to be warming up as it should :o( I hope the hailstones didn't damage any of your plants. We haven't had any here, but it's very windy and chilly ..... I hope it warms up soon. All plants seem ok thank goodness. Poor Bill! I hope your bald patch is feeling better now lol :) We're off on a walking holiday in the Lake District soon so fingers crossed for better weather (we all know the Lake District's reputation for bad weather!). Some colour in my garden!